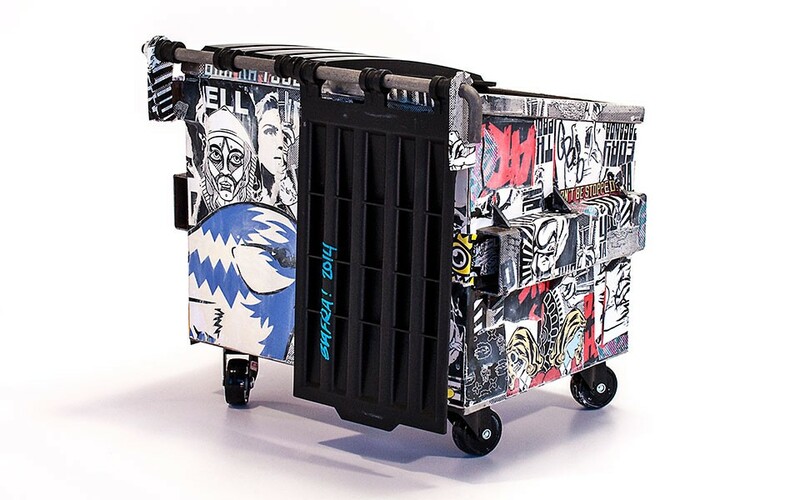 Dumpsters may be grungy, grotty, gross-smelling garbage holders but these ubiquitous urban trash bins positively bloom just by adding a little art. 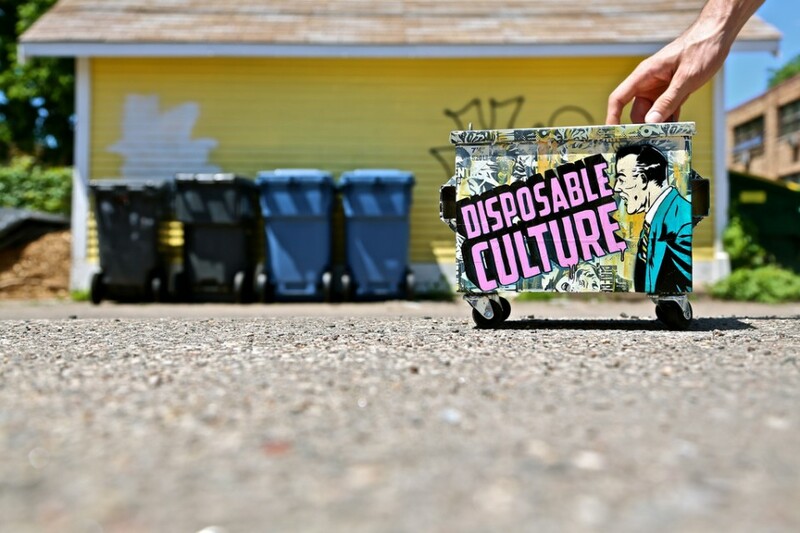 Our lead image comes courtesy of Flickr user Biafra Inc., and at first glance one wonders whether the dumpster is really that tiny or the photographer is utilizing some keen perspective manipulation. 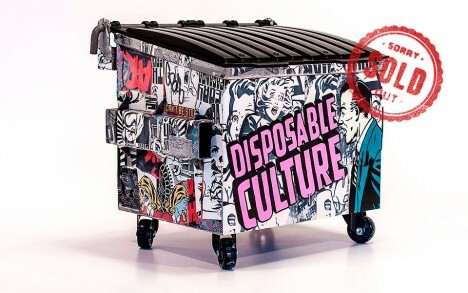 Wonder no longer: the dumpster actually IS tiny and you can even buy one (though not THIS one, it’s sold out) for your desktop at Dumpsty.com. 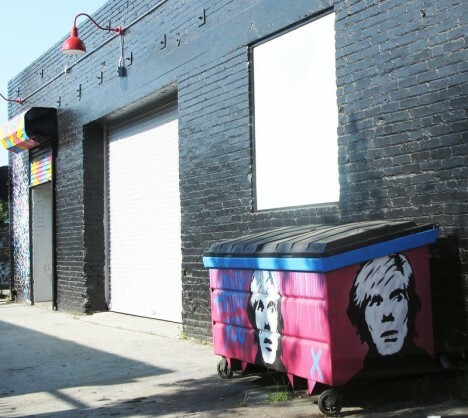 Dumpsters like the one above located in East Los Angeles take a lot of abuse both from the trash contractors who empty them and casual taggers who can’t resist their big blank accessible sides. 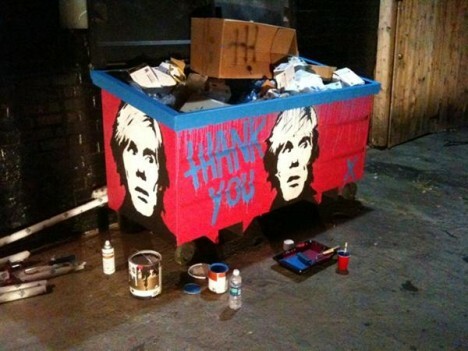 Some of the best dumpster art, therefore, works with the ambient conditions resulting in a gritty, visceral visual impression. 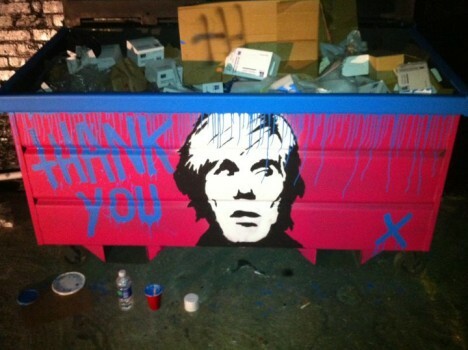 In April of 2011, urban artist X publicly thanked Andy Warhol for, well, being Andy Warhol. 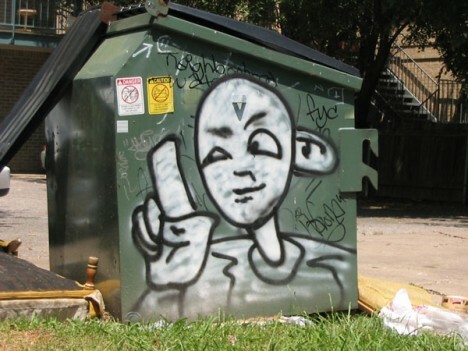 X‘s graphic homages appeared on the sides of high buildings, electrical boxes, dumpsters and more. You’re welcome. 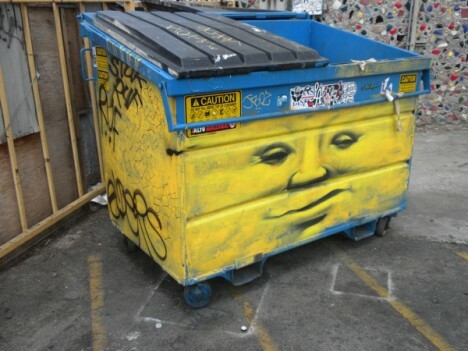 Just what is the most common dumpster base color, anyway? Some manufacturers go for dark blue, others opt for the above shade of dull gray-green perhaps because it’s one of the most blah hues imaginable. That kind of thinking can backfire, however, should an enterprising graffiti artist choose a contrasting shade for his/her art. Flickr user Dan Machold (danmachold) discovered a perfect example just off Speedway in Austin, TX.